Missed this urban fantasy anthology in my February release list. There is a Zoë Martinique story called Web Ginn House by Phaedra Weldon which is a prequel to Wraith (which is part of a fab series). Couldn’t find much on the other contributors. If you know, feel free to post it in a comment. When magic is used for criminal purposes, all sorts of ethical and logistical questions arise beyond the realm of everyday law and order. Now, sixteen top tale-tellers offer fascinating new stories of those who commit magic crimes, those who investigate them, and those who prosecute them. 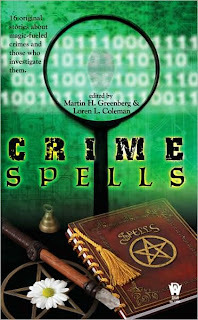 From a young woman who uses out-of-body excursions to research paranormal crimes to a bookie who's been paying for hex protection against magical interference to an artist who does divination through his sketched visions which may lead to a murderer's undoing, here are powerful tales of magical crimes and punishments. Devon Monk announced on her website that her publisher has picked up three more books in her Magic series with Allie Beckstrom. Heck we haven’t even had a chance to read Book 2 yet. Apparently they are planned to be released on a 6 month schedule which is good news for fans and readers. Here’s the series as planned (from Devon Monk’s website) with tentative dates for the new books. 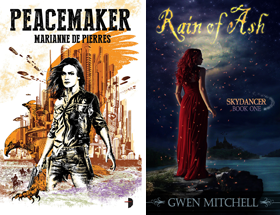 The League of Reluctant Adults has rebooted their website and expanded their membership with an even larger cast of fabulous urban fantasy and paranormal writers. Lots of great posts and even a few giveaways. Here’s the list of Reluctant Adults so far with links to their home websites. P.N. Elrod is editing and has a story in Dark and Stormy Knights, a collection of supernatural, modern-day knight stories with a rich line-up of authors including Jim Butcher, Rachel Caine, Shannon Butcher, Carrie Vaughn, Lilith Saintcrow, Vicki Pettersen, Deidre Knight and Ilona Andrews. Release date is not known. Harlequin turned 60 years old last week and is offering 16 free books (in digital format including PDF, MS Reader, ePub, and more) at www.HarlequinCelebrates.com . Paranormal romance fans will interested in the Silhouette Nocturne title Kiss Me Deadly by Michele Hauf. Death cocktail is what the vampires call a witch’s blood. It’s poisonous—a drop will destroy a vampire within minutes. Nikolaus Drake is the rare vampire who has survived his first taste. Now he’s on the hunt for the witch who almost brought him to his demise—Ravin Crosse. A witch who spends her nights hunting vampire tribes, Ravin has three obligations to fulfill to set her soul free. One of those obligations—crafting a love spell—twists her world upside down when Nikolaus draws the spell from her veins. Natural enemies rarely make the best bedfellows—but is it possible their intentions are really, truly the same? Can Nikolaus’s tribal loyalty survive if he surrenders to desires far darker than his own?